Dain thlen falls are located about 2 km away from Cherrapunjee. This fall is conspicuous as its beauty is enhanced by the presence of large number of natural potholes, much bigger in size and dimension than the regular ones on roads. The view of this waterfall tumbling down from a height of close to 80-90 m is really spectacular, something that you can’t miss during your visit to Cherrapunji. There is a small legend associated with the name of this fall. According to locals, there was a huge demon python by the name of Thlen who was filled with greed and power. Some brave men caught the animal and destroyed its hood with a huge stone near this fall. Some of the marks present on the stones are still reminiscent of the violent struggle of that snake, say the naysayers. The turbulence of this fall gathers a lot of steam during the monsoons compared to the rest of the year and offers a great view. Tourists visiting the waterfall can explore the natural rock carvings of the snake, which represent the symbol of evil, greed and corruption. Tourists visiting the waterfall can explore the natural rock carvings of the snake, which represent the symbol of evil, greed and corruption. 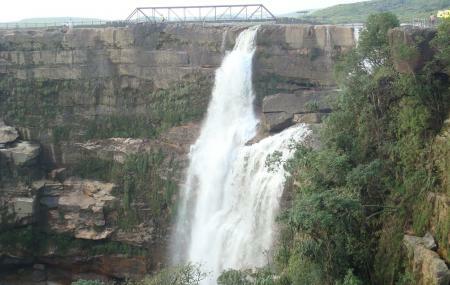 You can view these falls as you reach towards Cherrapunji. How popular is Dain-thlen Falls? People normally club together Eco Park and Durga Temple while planning their visit to Dain-thlen Falls. Walking on rocks & water - standing over a splendid fall A vast plain and open red rock bed, thru which water flows in naturally made channels, and goes into a deep splendid fall. Spend some relaxing time here and get mesmerized into the wonderful views around. Its a very different experience here. A must visit. There are also a few local stories about this place and about the naming of this place. Beautiful waterfall in Cherapunji. The falls can be viewed from the top as the water splashes into the deep valley below. Top of the waterfall is is large level ground, interspersed with many water channels. There are a few shops selling eatables near the falls, but don't expect any toilet facilities. Good fall but has restricted view and approach is bit risky while negotiating the location from parking side. Water, slippery ground and bamboo foot temporary bridge is risky and not safe. View is also bit restricted which can be improved. Facilities are not up to Mark and hygiene needs lot of improvement. Wash rooms were stinkibg and we're paid one. Quite unique view from the waterfall, with different rock formations on the river bed. Great time to visit would be around November.